Our princess Bessie passed to the peaceful side 1/2619. Bessie was born, but of course, on 2/14 07. I say “of course” because this living being gave more LOVE than being I’ve ever met in my 54 years. Anyone who came into contact with her HAD TO STOP and be kissed beyond recognition by her. She was an English Bulldog and so gorgeous. Even as an “ugly face” Bulldog, everybody commented how beautiful she was. Bessie was the beloved baby to 4 loving parents: Marie and I and Ramiro and Marena. Marena would cook weekly a concoction of an entirely organic recipe that would leave any human with not only a great taste, but with more health than any meal you could ever dream of. Here is a SHORT list of what was in the meal: wild bison, spinach, green beans, butternut squash, brown rice, turmeric, flax seed oil, krill oil, pumpkin, plain yogurt , Chinese herbs (exotic), Noni fruit leather organic from Hawaii , plus about 7 more vitamins and extracts. The picture attached is one of many many places she touched with her love. 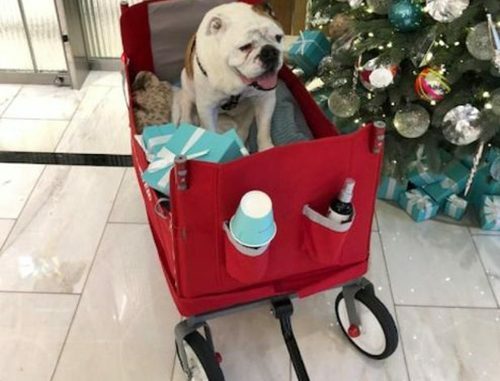 Bessie became the official mascot of Tiffany’s Bal Harbor. After 1 fateful day, I brought her in her truck. Bessie was actually paralyzed 5 years ago from a stroke. A couple followed us in to Tiffany’s with no intention of buying anything. They only followed us in to meet Bessie. The majority would either have to stop and take pictures and many would have to stop and physically have contact with her. My wife Marie and sister Marena were the main care takers of Bessie. It became her life’s passion and it showed me a level of pure unconditional love that I had never seen in my life. Bessie had issues being a handicapped English Bulldog. But it never stopped Marena or Marie and Bessie herself, never stopped being active. I loved to Bessie in action with only 3 legs. She was relentless with balls, Frisbees or any toy. But you throw a ball, forget it. That ball had to be hers. I am sharing this angel, not for bragging rights. I am sharing her simply because she is the most incredible loving being many have ever met. She is having a blast on her new journey – 4 good legs and still with the same appetite! Yes she was a beggar of food. Too bad for formal dog owners. She deserved it.